I am pleased to report that the architectural tour, which took place last Saturday, in Bellu Cemetery, considered in many aspects as the National Pantheon of Romania, was well attended, despite the sleety weather that we had to face that afternoon. That followed a stormy night, which caused mayhem in Bucharest. In fact we encountered, within the cemetery itself, torn away tree branches blocking the alleys and even an uprooted old tree that has fallen over some of the gravestone, fortunately without causing much damage, facts that all concurred to producing, of what one might say, a perfect cemetery visit atmosphere. The place is really vast, over 28 ha, if we just take into account its main Christian Orthodox denomination section. We were thus able to encounter a multitude of fine architecture monuments hosting the earthly remains of important personalities of this country. The funerary structures display in general the three main historical styles that characterise the local urban architecture from Little Paris, Neo-Romanian to Art Deco and Modernist designs. There are also monuments in ethnographic and composite styles. An important objective of the tour was the viewing and examination of monuments designed by the architect Ion Mincu (1852 – 1912), the initiator of the Neo-Romanian style, which are among the finest in the entire cemetery, for example the sepulchers of G. Gr. Cantacuzino, M. Ghica, or the Gheorghieff brothers. 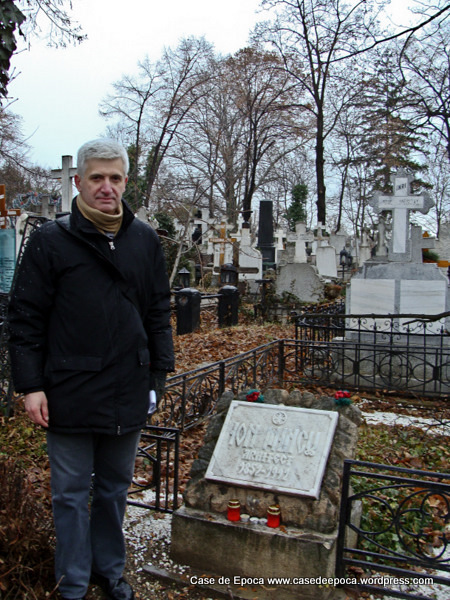 I also brought the participants to Mincu’s grave, where the photograph presented above was taken. To our astonishment, the grave was without a cross or other more apparent funerary monument, except a name plate on a small pedestal outside the grave area itself, a sure sign of neglect from the public and authorities regarding the memory of this important figure in the history of Romanian visual arts. 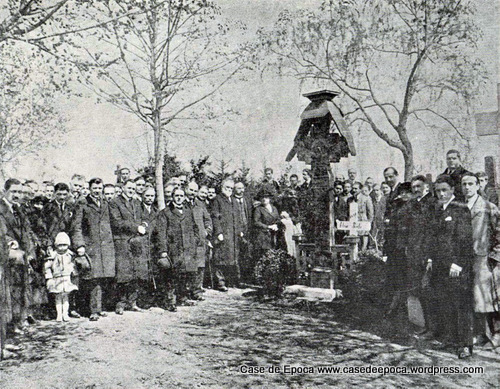 The parcel was in the past embellished with a beautiful Romanian peasant wooden cross, as can be seen in a photograph from the 1920s, in the image bellow, depicting a remembrance gathering of Mincu’s students at his burial place. It is amazing and shocking that now, in 2012, when we commemorate one hundred years since the great man’s death, that there is nothing put in place to properly mark his grave, not even by the Architecture University “Ion Mincu” in Bucharest, which bears his name, and is the chief higher education institution in that field of this country. I just hope that something is in the making, now at the centenary of his death, by the university or other institution, to right that tragic anomaly!